The portrait painted by John Cooke in 1915. Back row (from left): F O Barlow, G Elliot Smith, Charles Dawson, Arthur Smith Woodward. Front row: A S Underwood, Arthur Keith, W P Pycraft, and Sir Ray Lankester. Arthur Keith (February 5, 1866 – January 7, 1955), was a Scottish anatomist and physical anthropologist, a leading figure in the study of human fossils. A strong supporter of Charles Darwin, he wrote more than 500 publications in the area of human anatomy and human evolution. He was knighted for his contributions to science. Keith accepted evolutionary theory as a valid account of the development of humankind, but emphasized Jean-Baptiste Lamarck's law of the "inheritance of acquired characteristics" as a key mechanism beyond chance or natural selection alone. His reputation suffered greatly when he defended the discovery of the Piltdown Man, which subsequently was found to be a hoax. Keith regarded the evolution of human races as the "evolutionary harvest" of nature's efforts, and rejected Christian ideals of breaking down racial barriers. Nevertheless, he expressed some novel ideas regarding the development of human society through factors such as competition based on nationalism, patriotism, and the difference between "in-group" and "out-group" social relationships. Arthur Keith was born on February 5, 1866 in Aberdeen, Scotland, the sixth of 10 children to John Keith and Jessie MacPherson. After Charles Darwin published his Origin of Species in 1859, Keith became so impressed with the book that he decided to prepare for a medical education. He obtained a Bachelor of Medicine at the University of Aberdeen in 1888. There, he came under the influence of botanist James Trail and anatomist John Struthers. After his graduation, he accepted the post as medical officer to a mining company in Siam, and traveled there on a gold mining trip. There he became interested in local monkeys and apes, and started to collect information on their anatomy. It was also there that he started to write on human evolution. After three years, upon his return to Britain, Keith decided to study anatomy. In 1894, he was awarded an M.D. by the University of Aberdeen for a thesis entitled The Myology of the Catarrhini: A Study in Evolution. In the same year he was made a fellow of the Royal College of Surgeons of England. In 1895, he was named Senior Demonstrator of Anatomy at the London Hospital and in 1899 he was appointed head of the department. In 1897, he published An Introduction to the Study of Anthropoid Apes. In 1900 he married Celia Gray. In 1908, Keith resigned from the hospital to become the Conservator of the Royal College of Surgeons Museum and shortly thereafter he became president of the Royal Anthropological Institute of Great Britain (1912-1914). He published his Ancient Types of Man in 1911. He also served as the fellow of the Royal Society from 1913 and Fullerian Professor of Physiology at the Royal Institution, from 1917 to 1923. Keith was knighted in 1921. In 1927 he was appointed president of the British Association for the Advancement of Science, and in 1930 a rector of the University of Aberdeen (1930-1933). In 1932, he helped found a research institute in Downe, Kent, where Charles Darwin once lived, and the following year Keith was appointed Master of the institute, where he worked until his death. Keith died on January 7, 1955, in Downe, Kent, England, at the age of 89. Keith is best remembered for his contributions to physical anthropology. In his early career however, he spent a considerable amount of time researching human anatomy. His studies on the causes of cardiac arrhythmia deserve mention. Together with Martin Flack, he described the "sino-auricular node" of the heart and its function. He published his well-known text Human Embryology and Morphology, in 1902, which reached six editions. In 1911, Keith published his Ancient Types of Men, which marked his turn to anthropology. He claimed that the Homo Sapiens species had a longer history than was previously believed. Keith argued, similar to French paleoanthropologist Marcellin Boule, that Neanderthals were not the direct ancestors of humans. 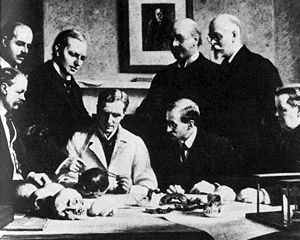 After the discovery of the Piltdown man by Charles Dawson in 1912, Keith joined the group of scientists who defended the discovery. He argued that the skull was morphologically similar to modern humans, but did not directly question its authenticity. It was later discovered that the Piltdown man was a hoax, and Keith’s reputation suffered. Keith also made a comprehensive study of the human fossils uncovered in the caves of Mount Carmel, near Haifa in Israel. He published his discoveries in his book entitled The Stone Age of Mount Carmel: the Fossil Remains from the Levalloiso-Mousterian (1939). Keith also wrote on the evolution of races. He believed that nationalism is a strong factor in the evolutionary development and differentiation of human races. He emphasized the competitive factor as the key in evolution, and saw racial and national prejudice as inborn. In his book New Discoveries Relating to the Antiquity of Man (1931), Keith claimed that evidence suggested that modern races emerged from types already differentiated in the early Pleistocene. In his Concerning Man's Origins (1927), a book based on his presidential address at the British Association, Keith wrote a chapter entitled "Capital as a Factor in Evolution" in which he proposed an interesting explanation for Britain's leading role in the development of Industrial Society. Essentially, he argued that the cold unwelcoming climate of Britain selected those who came here based on a special ability to store up food and supplies for the winter - those who didn't died out. This "capitalism" provided a secure way of life with time to think and experiment, for a population that had been selected for inventiveness and resourcefulness. Out of this special population sprang the Industrial Revolution, centered on the colder northern parts of England where the technological developments of the time took place in spinning and weaving. In his often quoted work, A New Theory of Human Evolution (1948), Keith put forward his ideas on the co-evolution of human beings, races, and cultures, covering topics such as patriotism, resentment and revenge, morality, leadership, and nationalism. His particular theory emphasized the ideas of "In-group versus Out-group," and the "Amity-Enmity Complex." One chapter of this work, entitled "The Jews as a Nation and as a Race," tackled what is often referred to as "the Jewish Question," postulating that the Jews are a special case of a race that has evolved to live as the "out-group" amongst other races. This led them to develop a special culture that enables them to survive by means of strong cultural traditions that bind the "in-group" with unusual loyalty and defensiveness. Christianity makes no distinction of race or of color; it seeks to break down all racial barriers. In this respect the hand of Christianity is against that of Nature, for are not the races of mankind the evolutionary harvest which Nature has toiled through long ages to produce? May we not say, then, that Christianity is anti-evolutionary in its aim? (Keith 1947, 72). In 1934, Keith felt impelled to engage in the public debate over the controversy of the Loch Ness Monster. He wrote a letter to the Daily Mail stating that "the existence or nonexistence of the 'monster' is not a problem for zoologists but for psychologists," (Keith 1934) and criticizing the contradictory testimonies of witnesses. The Piltdown man hoax seriously undermined Keith’s reputation, and as a result his work and legacy are often seen in a dim light. He was a strong supporter of Darwin as well as an agnostic, and he liked to participate in public debates on such controversial topics. Keith wrote more than 500 works, mostly in the area of comparative anatomy and evolution. Many of his ideas were revived with E. O. Wilson's publication of Sociobiology and now thrive under the title of "Evolutionary Psychology." Keith, Arthur. 1897. An Introduction to the Study of Anthropoid Apes. London: Page & Pratt. Keith, Arthur. 1902. Human Embryology and Morphology. London: Arnold. Keith, Arthur. 1911. Ancient Types of Man. London: Harper & brothers. Keith, Arthur. 1915. The Antiquity of Man. Williams & Norgate. Keith, Arthur. 1919. Nationality and Race. London: H. Milford. Keith, Arthur. 1920. The Engines of the Human Body. London: Williams and Norgate. Keith, Arthur. 1925. "The religion of a Darwinist." Conway memorial lecture delivered at South Place Institute on March 26, 1925. London: Watts & Co.
Keith, Arthur. 1927. Concerning Man's Origins. G. P. Putnam's Sons. Keith, Arthur. 1928. Darwinism and what it implies. London: Watts & Co.
Keith, Arthur. 1931. New discoveries relating to the antiquity of man. London: W. W. Norton. Keith, Arthur. 1934 "At Loch Ness" in TIME, magazine 1934. Retrieved on April 15, 2007. Keith, Arthur. 1939. The Stone Age of Mount Carmel: the Fossil Remains from the Levalloiso-Mousterian. Oxford: Clarenton Press. Keith, Arthur. 1947. Evolution and ethics. New York: G. P. Putnam's Sons. Keith, Arthur. 1948. A New Theory of Human Evolution. Keith, Arthur. 1950. An Autobiography. London: Watts. Encyclopedia of World Biography Encyclopedia of World Biography on Arthur Keith. Retrieved on April 10, 2007. Sir Arthur Keith. Minnesota State University. Retrieved on April 10, 2007. Quotations – Some quotes from Keith’s works. This page was last modified on 23 November 2016, at 20:11.